Users can choose between two different key formats depending on their personal preference. Lucid Phoenix keys are interactive keys that are still dichotomous and a choice needs to be made at each key couplet to continue. For more information concerning Lucid keys visit www.lucidcentral.org. Lucid Phoenix key to Afrotropical genera and species of Megalyridae. Key to Afrotropical genera of Megalyridae. Key to species of Dinapsis. Shaw, S.R. & van Noort, S. 2009. 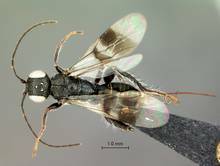 A new Dinapsis species from the Central African Republic (Hymenoptera: Megalyridae: Dinapsini). Zootaxa 2118: 30-36. Keys developed by Simon van Noort. Photographs included in the keys © Simon van Noort (Iziko Museums of South Africa).